Will my gate lean or drag the driveway later? Many gates, over time, will start to lean and even drag the driveway because many companies only set the hinge post 3½ to 4 feet deep. All of our gate hinge posts are set extra deep, at 5 feet. We offer a 10 year warranty against our gates leaning or dragging the driveway. Can kids or pets push the gate open? The 35” top arrow marks the location where we removed the Elite short arm opener. 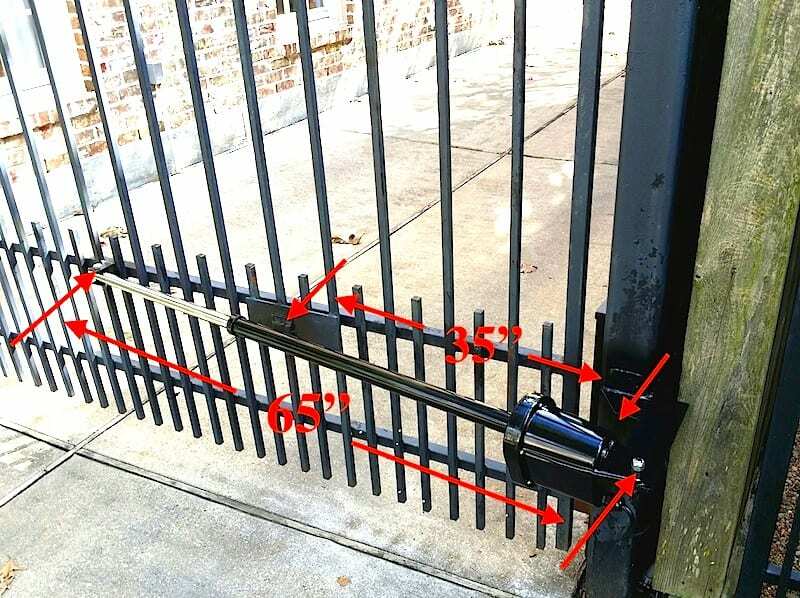 Most of the short arm openers will not come close to holding a gate shut as tightly as our modified 65″ long opener will. Why are many control boxes rusting? 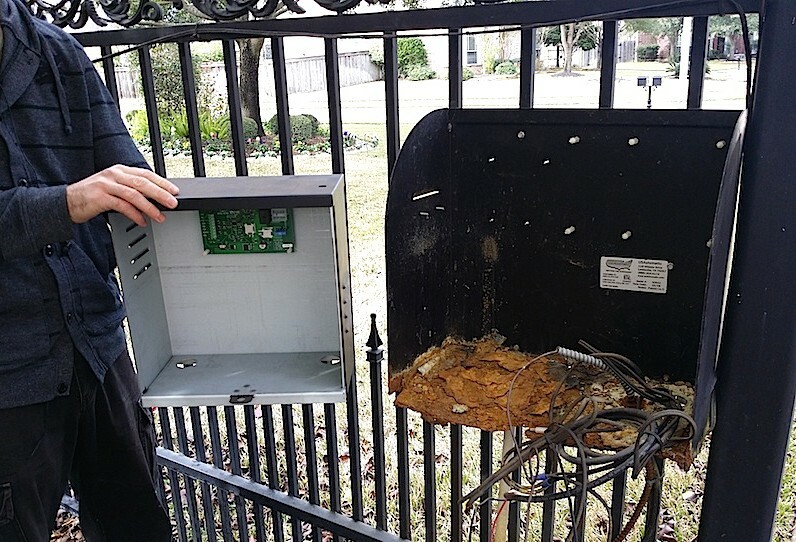 We have seen over time many control boxes rusting. Most of the gate opener industry will use “wet batteries” in their control boxes. Over time, some of the wet batteries will sweat or leak acid out and this will cause advanced early rusting. In 2004, we started using leank proof maintenance batteries in all our systems. Why are many gates bowed? 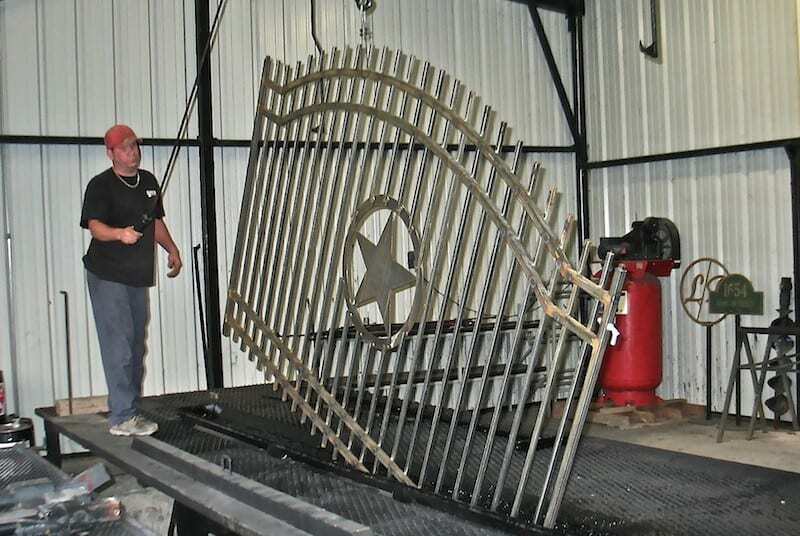 Approximately 80% of gates will have a bow in them because of the heat from welding the pickets on the front site. To assure our gates are straight, we counter heat the backside frame to pull all of our gates and fence sections back to straight. Why does paint chip or flake off easily? Many gate paint jobs chip and flake easily. The reason for this is that the steel was not prepared for good paint adhesion. 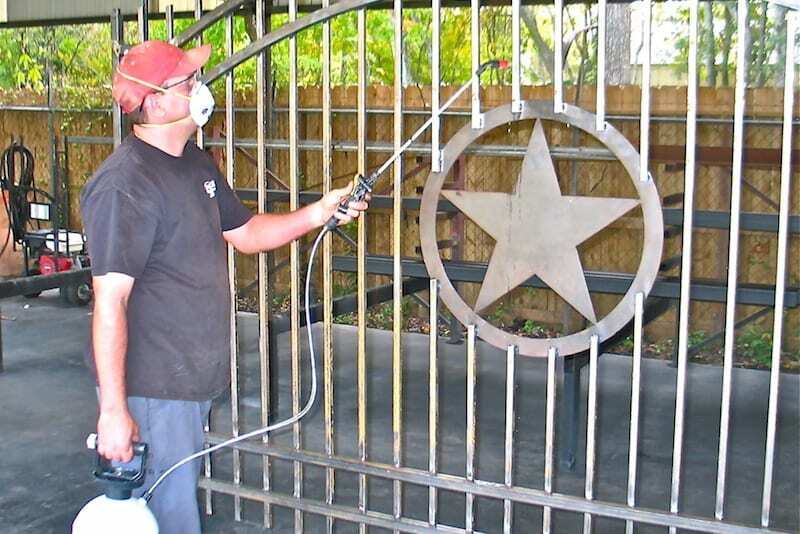 We acid clean all our gates and fence sections for superior paint adhesion. Will pickets and gates rust from the inside? Sprayed gates lack the paint coverage inside the pickets and outside where the pickets lap the fame. Our special dipping process assures 100% paint coverage both inside and out. Shopper’s Checklist — Will the competition? 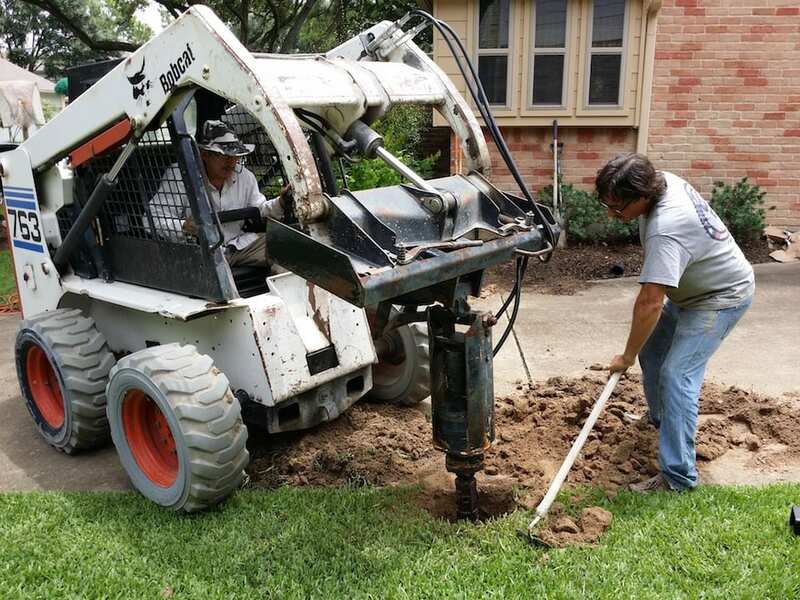 Have the equipment to set the post 5 feet deep? Heat the gate and fence sections to be straight after building them? Acid wash 100% of the steel for proper paint adhesion? Have a custom dip tank to insure 100% paint coverage inside and out? 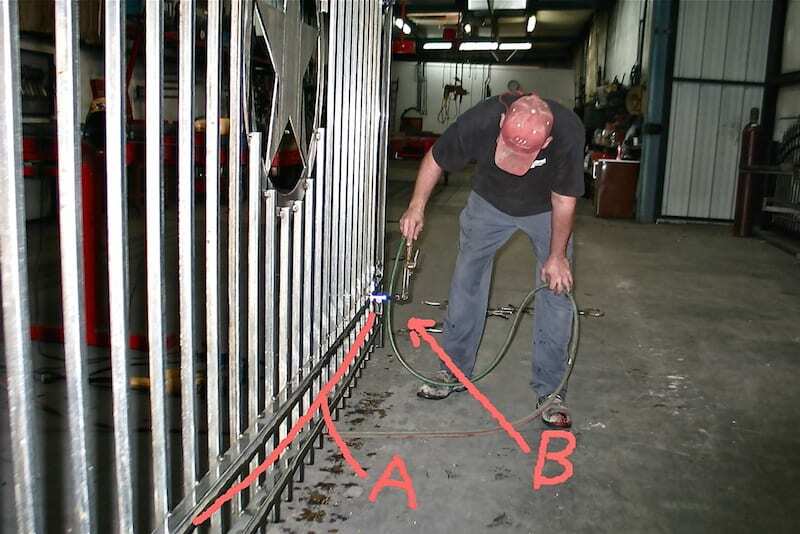 Have a modified 65″ long opener to hold the gate tightly shut? Offer same business day pricing? Be a recipient of the prestigious Angie’s List Top Job Service Award? Be available to call or text the business owner up until 8:00 PM? Thanks, we hope to earn your business! We will usually get back with you by phone within an hour of the time you send us your photo. Make sure we can see the entire gate and the problem you are having.